Eye Movement Desensitisation and Reprocessing (EMDR) is a scientifically validated therapeutic approach to managing emotional and psychological problems. EMDR was originally developed for the treatment of Post Traumatic Stress Disorder (PTSD). More recently, clinical research has demonstrated that EMDR provides an effective treatment for phobias, panic disorder, Obsessive Compulsive Disorder, chronic pain, performance anxiety, complicated grief and sexual and physical abuse. EMDR works by changing the way the brain processes traumatic or distressing memories, cognitions and emotions. This is known as Adaptive Information Processing (AIP). This involves integrating new information into existing memory networks, using bilateral stimulation and duel attention. The therapist helps the client to focus on the images, Thoughts and feelings associated with traumatic or distressing situations, whilst similtaniously undertaking eye movements, listening to tones or using physical taps. During the Desensitisation phase, the client is asked to bring to mind the memories, images, thoughts, emotions and sensations associated with the traumatic or feared situation. Bilateral eye movements are used to keep the client anchored in the present whilst observing or re-experiencing the effects of the distressing situation or memory. Once the client's trauma or distress levels have reduced, the Reprocessing phase is used to install an adaptive coping belief to deal with future triggers or memories. Undertaking a detailed psychological assessment of the presenting problem. This normally involves talking about background factors, traumatic incidents, associated problems and any other underlying vulnerabilities. Preparing and educating the client on the EMDR process. 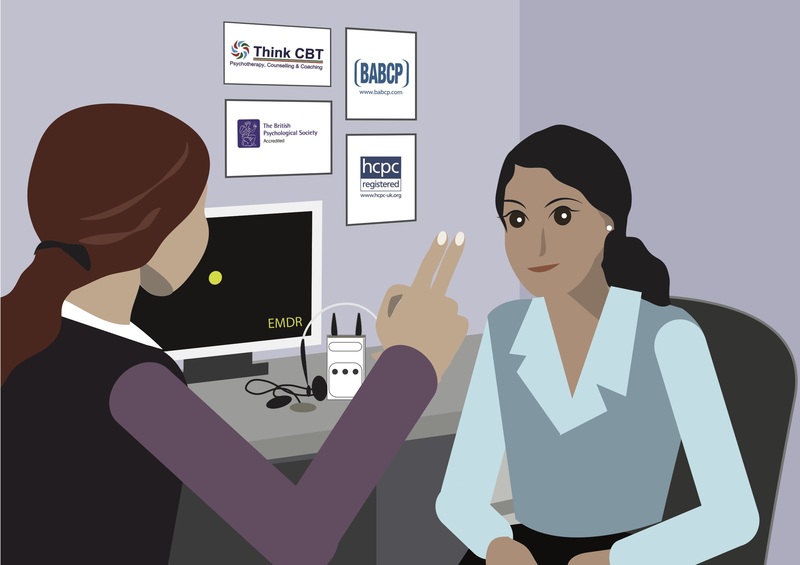 This involves explaining the approach and training the client in good coping techniques before starting the EMDR process. Completing an EMDR assessment of the images, thoughts, emotions and physiological sensations associated with the traumatic or distressing event, as well as working on a preferred realistic appraisal. Undertaking bilateral stimulation (eye movements, taps or tones) to desensitise the client to the traumatic or distressing reaction. Using eye movements, taps or tones to install positive cognitions and emotions associated with a realistic and functional appraisal of the traumatic or distressing memory. Undertaking a self-body scan to identify any remaining distressing sensations associated with the original memory. Bringing the process to a close and checking for any other links or associated distressing reactions. Reviewing the client's initial therapeutic goals and testing resilience by identifying real life situations that the client would normally find highly distressing. Research studies have consistently demonstrated that EMDR can significantly accelerate the healing process after a traumatic experience and that the effects are long lasting. There are now more scientific studies into the use of EMDR for Post Traumatic Stress Disorder, than for any other clinical or therapeutic approach. EMDR provides a fast and relatively unobtrusive approach to changing the underlying cognitive and neurological patterns that maintain traumatic emotional reactions, as well as a wide range of other anxiety and depression related problems. .
EMDR is designed to be used as a stand-alone process, but can also be effectively integrated into Cognitive and Behavioural techniques for the treatment of trauma and anxiety. If you want to find out more about how we use EMDR or book an initial free telephone consultation, you can complete the simple contact form on this page. When people experience traumatic or highly distressing events, the brain can become temporarily overwhelmed and unable to effectively process or integrate information in the normal way. Consequently, traumatic experiences can become stored as fragmented and intensely disturbing memories, images, emotions and bodily sensations. This can lead to severe psychological distress involving frightening intrusive thoughts, flashbacks, nightmares, dissociation and hyper arousal when the traumatised person is triggered or under stress. Traumatised people often report a dissociative state in which they "re-experience" the traumatic event itself or the overwhelming emotional, psychological and physical sensations associated with the event. This is common in people suffering from Post-traumatic Stress Disorder, (PTSD).